Larry, the man who never launched into the unknown but, nevertheless, traveled widely, joined a tour group that was scheduled to cross Siberia on the transcontinental train, and see other prime sights too, such as Leningrad and Moscow. Some optional trips were featured too, but arrangements were to be made later, depending on how many people actually showed up at the starting gate and signed up. Arriving in New York after a flight from Seattle, Larry found the group and after the usual processing, was flying out of New York's JFK airport and on his way to experiences he had never in his wildest mind envisioned for himself, nor did he want. Everything went more or less routinely at the onset, however, so he did not have any inkling of what lay ahead, otherwise he would have cancelled immediately. The group toured Moscow and Leningrad, and on the first optional tour they all agreed to doing, the capital of SSR Georgia, a Soviet Republic at the southern end of the sky-scratching Caucasian Mountains. That was acceptable, but how did he know the ladies would come up with another optional sidetrip, just to break up the long flight to Soviet Georgia? He found it convenient to blank it out afterwards, which was easy enough for him to do, as his neat mind was suited for compartmentalization. Once he was in Soviet Georgia, he soon learned that the past was just as important, even more important in many cases, as the present. The ancient Greek Argonauts led by Jason had ended their epic journey and launching into the unknown in quest of the Golden Fleece--and the Georgians, proud descendants of the original people of Colchis (as the country was then called) were long of memory and had never forgotten the Argonauts. Traditions, songs, music, folklore, styles of clothes, even dances, all commemorated Jason and the Argonauts' famous visit to Aea, the capital of Colchis. 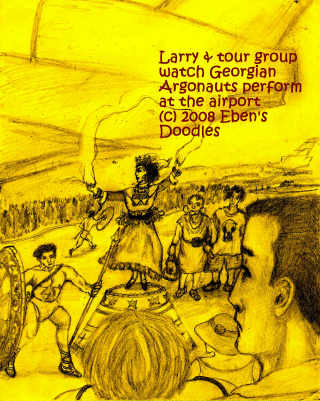 Tbilisi, the capital of Georgia, trotted out, for the entertainment of visiting Westerners at the airport, Georgian dancers and singers and acrobats, and their theme was, not hard to guess, Jason and the Argonauts. 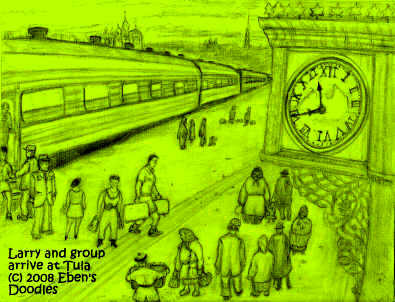 In a far-off time and space, Ero's mast head lifted from the Union Train Station in the City of Destiny continued on its cyperspatial voyage, penetrating one photo-cell after another, in the virtual relality world that never happened because they were the contents of the Sea of Doubt enclosing the Vampire Bat of the Carbuncle, the Stone of Doubt and Unbelief. Despite that, they were as real as they could be to Ero and all those who inhabitated those realms. Ero's programmed, flying mast passed over Tula, Russia, then moved toward the Tolystoyan estate called Yasnaya Polyana. Before this photo-cell played out its contents to Ero's view, Larry, in another time and place, viewing the dancers and performers attired in the archaic Greek mode, was not impressed. He hoped it would soon be over so he could go to the hotel and take a bath, even though it would probably be in in one of those strange contraptions seen all over the Soviet Union, the type he could just barely squeeze his six foot frame into, while spraying himself with a ridiculous hand-held device. His hopes of a nice, hot bath and an early dive into bed to catch up on lost sleep were dashed, however, when a charioteer drove through slowly as the star attraction of the Soviet Georgian welcoming committee's dance troop. "Oh, bummer, a chariot they dragged out of some dusty, old museum--what good is that anymore?" Larry thought in disgust. "When will these ignorant, backward commie Russians ever wake up to the fact we're living in the 20th century?" When Larry finally reached his hotel and took his ablutions in the usual contraption that passed for Georgian and Russian bathtubs and showers, he simmered inside with the unwelcome sensation that the water was not as hot as he wanted it. He had tried to get hot water out of the spigot, but it was tepid at best. Did they shut off the water heaters in the hotel after a certain hour? Apparently! They had to be conserving electricity, so the hotel had to make do with tepid water in the bath! Disgusting! Now he wouldn't feel clean, even if he used all the soap--which was poor stuff too, rough and grain-y, and not very pleasant smelling. Could the Russians ever learn to do things right? he wondered. He remembered--the similarity jolting two compartments so close there that interaction between two compartments occurred--a similar bar of soap, which he had used in the Russian hotel in Tula, where they had gone on an optional trip that turned bad. Before the already prerigged vote was taken, the guide had raved on and on about Tolstoy's estate, Yasnaya Polyana, and how they couldn't possibly bypass it and still claim they had seen Russia's "heart and soul". The drivel of that man! He was an outrageous scoundrel! And he was taking advantage of all the silly, emotional women, who were playing right into his wallet just like he wanted! Smelling a rat, what was a man to do? Larry abruptly took himsef out without a word and went to get an ice cream cone (as the hotel supplied no treats of any kind between meals) and avoid the vote. When he returned to face the bad news, he heard that the tour had voted, unanimously, with his one abstention, to take the optional trip at $150 American dollars extra. This is sheer robbery! he thought. But could he cancel now? He had invested too much already in the trip, to lose it now. So he had no choice but to go along. He was furious, but what else could he do? They were promised a look at Anna Kerenina and other beauties in Tolstoy's museum on the estate. She was supposed to represented by a perfect wax replica, which had a live audio in the exhibit. Tolstoy too was there, speaking in audio, from actual recordings by Alexander Graham Bell's newly created "phonograph," which was very one the famous inventor had sent the world-famous author to record his immortal voice. How could they pass this up--the doomed lover Anna who committed suicide when her husband took the child and cast her off, and the writer himself, Leo Tolstoy, who was Russia's greatest author? Despite his aversion to museums and the extravagant claims made for their smelly, old contents, Larry was in good enough humor to go along with the ladies and their aspirations--but what a mistake! So, instead of the nice direct flight to Tashkent as planned, Soviet Georgia! Then even before Soviet Georgia, the Tolstoy estate! These sidetrips were driving him crazy, before he even went on them! How could he keep a proper diary if the itinerary was always being changed on him? They boarded a train and traveled to Tula and disembarked, taking a ten mile bus trip to the estate hidden in the forest hills. Here they would see real, live peasants and take a look also at their quaintly carved, log-beamed cottages called izbas. The muzhiks, or peasants, all hereditary and ancestral families working the estate for many generations, give the group little attention, as they go on steadily with their work, apparently unwilling to be unpaid entertainers however prestigious the guests. 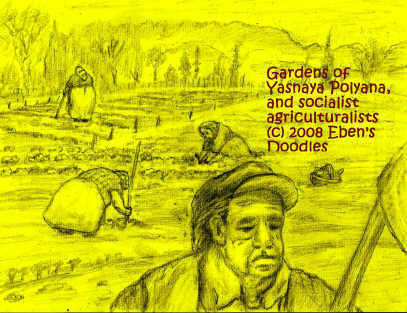 Yet a few are friendly enough, remembering that Yasnaya Polyana, under the original owner, Leo Tolstoy, was a place of hospitality, its gates always open, affording welcome to visitors from all Russia and many European countries, despite his wife who called even his disciples, "the dark ones" and hated strangers' intrusions on her family's privacy. As the guide began his tour of the estate in earnest, speaking from his prepared notes, he began telling them a popular legend everyone on the estate knew. 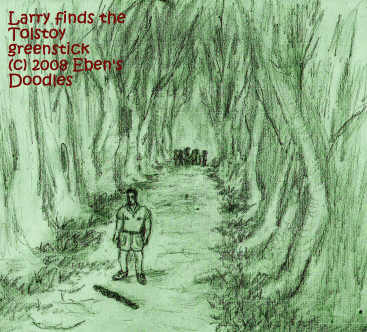 Count Leo Tolstoy, when a boy, found a magical stick of green color, supposed to bring happiness, and he and his brother dug down in the woods and hid it in a special place only they knew about, and his brother died, leaving only Leo who knew about it. Did he ever return to dig it up? someone asked the guide. "Nyet!" he declared most emphatically. "Else I would have heard of it, and seen it myself. 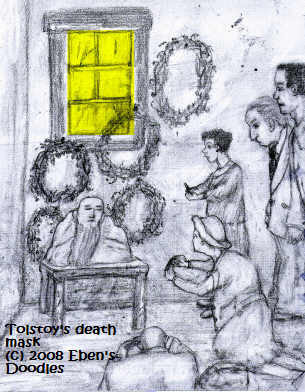 That is why I believe it is a complete fiction, just a story made up by two little Tolstoy boys!" 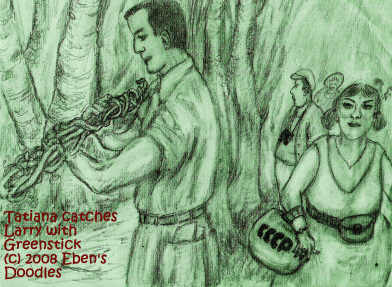 Tired of the slow procession led by the obnoxiously talkative guide, who stopped every few feet to explain something and give its exact dimensions from his notebook, Larry jogged ahead just to get out of range of the guide's annoying nasal voice. He was proceeding down the path between stately, old linden trees Tolstoy had planted when a wolfish looking dog ran across in front of him. Startled, it dropped whatever it was carrying and dashed off into the woods. Larry was examining the strangely twisted greenish vine that curled back upon its own stem when he grew aware he was not alone. Tatiana had caught up with him! What a sneaking, old snoop she is! he thought. Just to put her off, Larry gave the stick a swing and it flew into the bushes and undergrowth, and there was nothing to show that it had ever existed. "Sir, was that you were holding just now?" Tatiana demanded. "Nothing you would find interesting!" he said. "Just some old stick a dog dropped! Now would you please excuse me?" That was the end of the annoying conversation, he thought. She wouldn't have anything more to ask him about. As for the green stick, was it really Tolstoy's Stick of Happiness? Why wasn't it in a display case then in the museum? Why did he leave it hidden in the woods, for some half-wild mutt to dig up 80 years after his death? Was he in too much a hurry to get away from an old battleax of a wife to go retrieve the stick and take it with him on his last journey? They would never know the answers, Larry thought. Anyway, there were more important things to deal with--as far as the guide was concerned. He quickly shepherded them all to the next highlight on the itinerary. The great author's death mask, made when his face was overlaid with plaster where he lay in state in 1910 in a train station after fleeing his wife, was housed in a little building of its own that was stark and bare except for greenry wreaths people had left. The chief exhibits were to be found at the museum attached to the estate manor house, however. Here the guide regaled the group on Tolstoy's philosophical views and also his marital affairs. 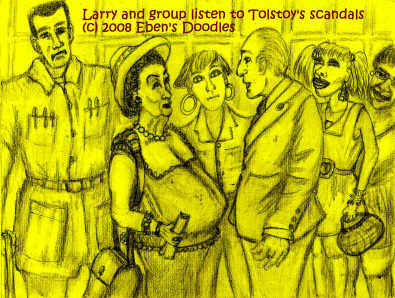 He made little headway generating interest with the great man's philosophy, but when he began telling about the young Tolstoy's escapades in the highest circles of Russian society in Moscow and St. Petersburg, the women crowded round him and hung on every word as Larry looked on, thoroughly disgusted. The young Russian count's portrait proved especially magnetic to the women, as they were caught like flies in a web by the dark, riveting eyes of the young and hopelessly debauched lady killer. 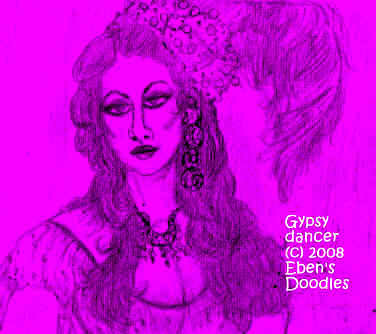 Leo's affairs with the society women did not interest him as much as the Gypsy dancers in the clubs, and a portrait of a Gypsy showed why. She was everything Madame Tolstoy was not--voluptuous, possessing an hour glass figure, dark eyed and her torrent of hair curling in every direction. No wonder she caught Leo's eye! 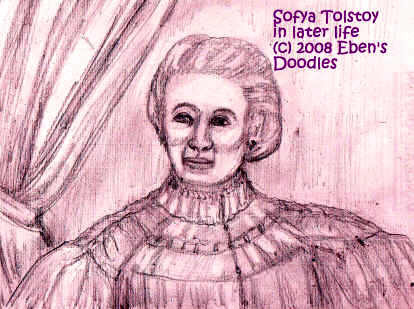 It was also apparent to everyone that Madame Tolstoy, for all her primness and propriety, was not one to trifle with, and so they understood, with one look at her, what Leo, her philandering husband who succumbed to the fatal attraction of attractive women of questionable morals, was up against all his life--and exactly why, years after he had ceased his womanizing, he fled the house in winter when he could not bear her accusations and suspicions any longer. The musseum tour concluding, the guide led them all to the most sacred place in the manor house. 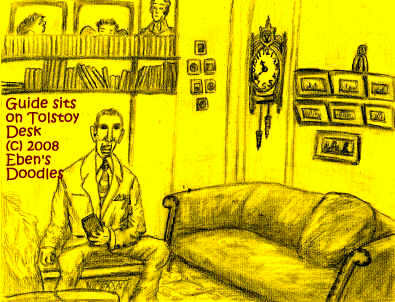 He sat in Tolstoy's study on Tolstoy's desk while everyone else stood. Next to the guide was the sofa on which Tolstoy was born. It was a revered place, indeed, impressing most everyone in the room from the tour, but the guide was having such a good time, he cracked one Russian joke after another, at Tolstoy's expense of course. When the jokes finally petered out, it was time for the traditional walk to the author's gravesite in the woods and the commemorative wreath laying ! And he happened to have the most beautiful wreaths for sale! the guide announced. Larry quickly found his way out, while the guide was shamelessly overcharging the women who wanted the wreaths. 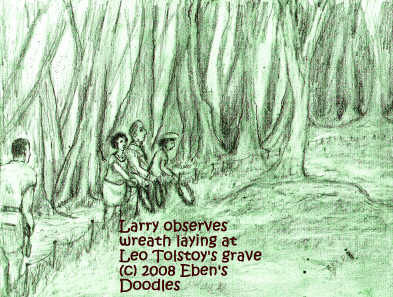 Larry's disinterest had communicated to the others, and only two women bought the wreathes and followed the guide to the author's grave. 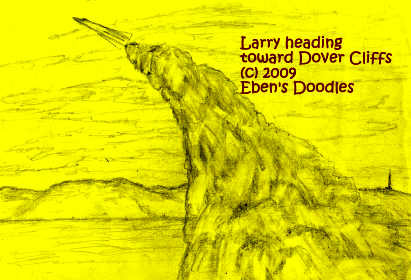 Just the same, Larry was interested enough to follow the pilgrims as the guide led forth to the spot where they could perform the ceremony. 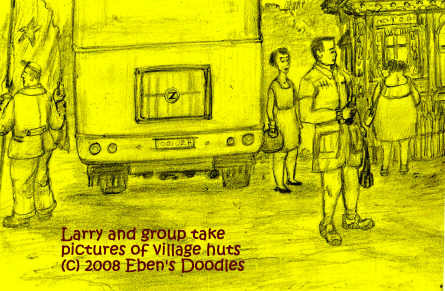 Larry noted that the guide was loitering behind when the women finished and walked back up the avenue of lindens toward the rest of the group waiting at the bus for the return to Tula. On a hunch, Larry kept his distance just enough from the guide, so he could follow him, and, as he suspected, the guide returned to the gravesite. There Larry watched him remove the wreaths, no doubt for resale, and put them in another place for safekeeping until he could return for them. This finished, the guide hurried to join the group. Larry let him go by, then followed at a discreet distance, but noticed something or someone was behind a tree, and he crept up as quietly as he could, and then realized it had to be Tatiana, for he saw a bit of her arm and clothing that told him who it was. 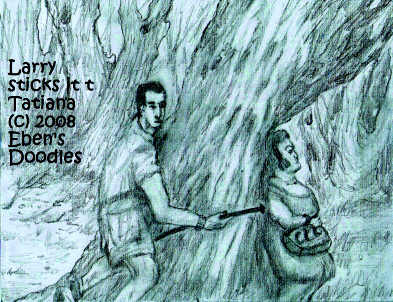 He went and pulled up a stake that held the fencing along the path, and reached round the tree where she was hiding on the other side. When he touched her arm with the iron stake, a moment passed, then suddenly she screamed, and bolted straight ahead and up the path, not taking one look back as she ran for her life. Nudged by the tip of the fence stake, Tatiana, the English-speaking mole planted by the KGB in the Moscow Tourist Office expressly to observe Americans, receives the scare of her life--an attack on her rather ample person with what appeared to her momentarily to be a gun with a silencer. Almost doubling over with laughter, Larry followed. It was hard to keep a deadpan expression when he rejoined the group, who were all looking at him and wondering what he could have done to make Tatiana scream like that and dash to board the bus, forgetting all her dignity. When Larry climbed on the bus, he noticed the strained atmosphere immediately, but paid no attention as he went to his seat. No one would speak to him, the women all taking her side apparently, so he took out a puzzle and worked at it happily, without any stupid interruptions from people. Ahead a few rows he could see Tatiana's annoying pig tails, but not once did she turn round to look his direction, which was proof the cabbage-eating dimwit was upset because she figured out who had stuck it to her and nearly given her cardiac arrest. "Served her right if she was scared silly!" he thought, laughing to himself. "I had her spotted from the moment I first saw her as a KGB snoop! Who do they think they are fooling? They'll have to get up early to get around me!" He turned to the scenery again as the bus started off, which also refueled the conversations, which had died abruptly when he jumped onboard, flashing everybody, even Tatiana, a toothy grin. Returned to Tula, the guide had a special attraction for the tour group, a visit to a space exploration museum, which had been recently put together and housed the rejected and obsolete overflow from the much bigger facility of the same type in Moscow. Untold billions of rubles had been thrown away on all sort of unworkable space hardware, and the government hoped desperately to recoup some of the rubles by staging a Ringling, Barnum and Bailey-type space circus show for them, which a smart American tourist like Larry sized up in a moment, of course, but which interested him a lot more than one hundred dead Russian authors anyday. 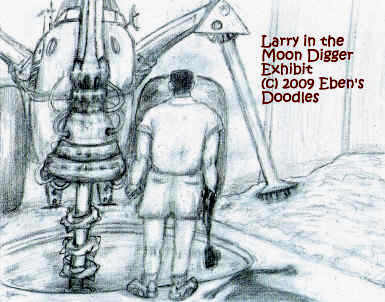 Being a man who was more comfortable with rolling stock and other machinery than he was with fellow human beings, Larry liked the exhibits so well, he slipped away from the guide and group to make closer, more intelligent inspections of the various exhibits. Looking into the prototype housing of one planned but cancelled robotic moon probe Krushchev had lost his shirt on (and maybe a shoe as well), which was designed for digging into the moon's crust for valuable metals and ores, he noticed that the missile shaft used for the digger's spike-pronged bit had no safety barrier. That was typically Russian! They cared nothing for people's safety--people were expendable! There wasn't even some yellow caution tape strung across the shaft. "Just like these dumb Commies," he thought, "with so many disposable people in the Soviet Union, they don't bother themselves about such things as safety and human life!" Of course, he didn't care that much either, to tell the truth--but he hadn't paid good money to discover himself, he was here to take a look at the Soviet Union and how it measured up to things back home! 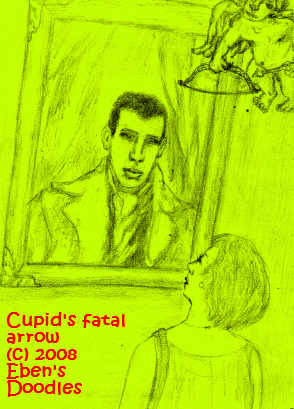 He was looking over the edge of the steel rimmed shaft when in the corner of his eye a shadow flitted swiftly his way. By reflex, he stepped aside. Immediately, a large, bulky object, cabbage-shaped flew past, lost footing, and tumbled down into the deep hole. There was a definite impact far below, a sound that resembled a lot of vanilla pudding (a lot!) splatting a wall. Larry peered over the edge of the hole, and wondered what he should do. Could it have been Tatiana? Had she really tried to rush him and give him a KGB-style accident? It seemed so farfetched. It was like something he read in spy thrillers or saw in the movies. Could she be so vengeful and hysterical a female to as that? But he reminded himself, she wasn't America. He couldn't apply the same standards to her. She was one of these half-civilized Russkies, who were not even really Europeans. Half their country or more was in Asia and Siberia--which meant they were civilized only skin deep at best. That explained their terrific emotional tantrums and downright savagery, peeling wallpaper in hotel rooms, and poor plumbing. What she experienced in the moon shaft she brought entirely on herself--as he had only been teasing her a little, and shouldn't have taken it so personally. After all, he cared nothing for her--so he knew he hadn't meant anything personal. Moving away, he went to find the guide, then reconsidered. Why would they believe him, that he hadn't pushed her in, if that was where she was? He would be arrested immediately, and considered guilty, as that was the Soviet way of doing things. His being American wouldn't count for much, not for years anyway. He'd be stuck up in some stinking, permafrosted Siberian gulag, to dig frozen turnips from the ground or take axes and chop out ditches or latrines, in the midst of a blizzard, starved and beaten up by the guards as often as they liked, while World Council of Churches bishops toured the facility approvingly while the U.S. ambassador in Moscow petitioned the Soviet Government, who no doubt would deny they knew anything about his whereabouts! No, he couldn't risk that fate. Imagine, having to grin and stand for group pictures and look happy whenever touring bishops and churchmen and other overdressed, sanctimonious old farts from the WCC and the various Human Rights organizations came to inspect how the prisoners were faring! It had happened to too many stupid travelers. 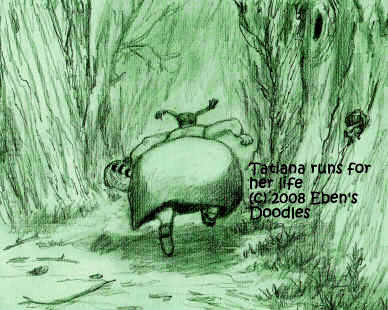 Best say nothing, and let THEM discover Tatiana's sad tumble down the "Moon Shaft." It was either him or her, right? Better it was her then! "Served her right too," he thought as he made his way back to the group, looking as bored and indifferent as he could. He bought an ice cream cone on the way just to reinforce the impression he wanted to make--that nothing unusual had happened to him lately. An hour later, as the guide was ready to wrap it up with the exact measurements and sizes of various mammoth objects of Soviet technical wizardry, an officer, by looks and uniform, pulled the guide aside, there was a hurried conversation, with many violent, over-emotional Russian-style gestures. Mopping his forehead with a big, not very clean handkerchief, the guide gave a very concerned look, counting every one of them on the tour several times, before slumping down on a chair. "I suppose now I ought to go ask him what is going on," Larry thought. They will think something a little fishy if I don't at least show some concern in the scene. He went over to the guide, while other women joined his lead, and then they heard that Tatiana was, indeed, missing. There was a security lockdown of the entire area, and a thorough search was going on, and they were to remain there until she was located. The Soviet authorities meant business about this, too, Larry saw--having brought in armed guards and stationed them at the exits. A look at the guide's face told Larry the rest of the story, however. As if he was staring into a future in a Siberian gulag, he was so pale, sweaty, and breathless, it had to be that Tatiana was already found, and it wasn't a nice discovery either. How long would it take for the KGB to make a decision and let them go? It was all the guides' fault for whatever happened--right? He was leading the tour--so he was responsible for anything that went wrong. 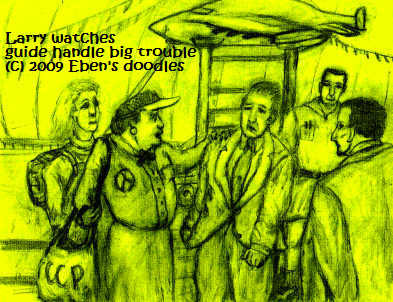 But though it was simple enough to decide, grab the guide and haul him off and let him and the others go to dinner, the Russian bureaucracy was notorious--it could take hours before they were considered harmless enough to be let go. They had wasted more than an hour so far! "All this fuss about that overweight, borscht-stuffed doofus?" he fumed. "As if they could care less about one minor agent, when they had thousands to replace her! Must be she hadn't filed her report to the Moscow HQ of the KGB yet, and they couldn't find it in the remains! It was the report, not Tatiana and the circumstances of her demise, that they were so concerned about. And unless it were tracked down, they could well as call the space exhibit hall home! He checked his Seiko watch again. He saw if they didn't leave soon, they would forfeit their reservations at a restaurant and the dinner already prepared for them, and any chance at a decent dinner for that night as well, as the hotel's food was little better than a greasyspoon's. 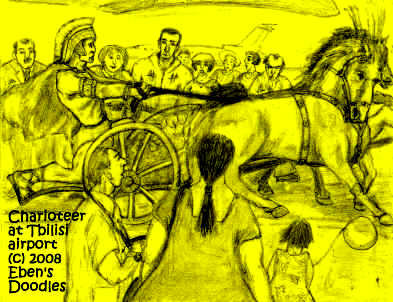 As he was doing that, a hoofer who plied her trade in the Space Museum's exhibition hall, gave him the eye, but as he showed no interest in her assets, she passed on to catch other prospects before everyone left for the night and she was alone with only the cleaning crew (typical Russians who had few rubles to spend). Hungry and bored stiff, Larry walked away, looking for an ice cream vender, but he couldn't find one, and then circled the hall, hoping to spot something he hadn't seen before. Oh, yes, the old nuclear rocket! He had read about it in the brochure the guide handed out when he brought them all there to take a look at the artistic renderings of the rocket in space flight. Looking as casual as he could, keeping his eye out for anyone possibly following him, he made his way over to the older rocket array where the nuclear rocket was standing, biggest of the lot. 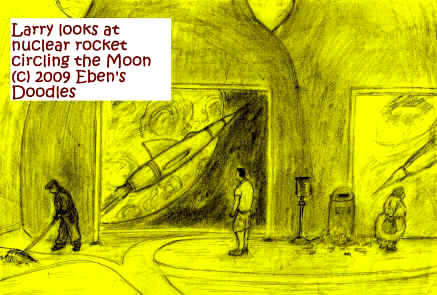 Larry took a second look at the rocket portrayed on billboards close by the booster thrusters. The Moon-Mars-Alpha Centauri mission was scrubbed in the 1960s, the same time America scrubbed her own billion dollar nuclear rocket and turned to solid fuel boosters and the space shuttle--just too many sticky problems with the rudimentary nuclear fuel technology of that day to find quick solutions without high speed computers. 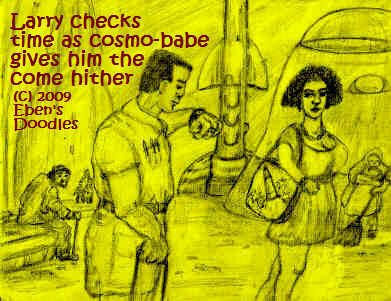 But the rocket flew without a hitch otherwise--test models had demonstrated a nuclear engine could be a superb space engine, requiring tiny amounts of fuel that lasted almost indefinitely with even primitive recycling, thus enabling tremendously fast and long flights into far reaches of the Solar System and even beyond, but the exposure to humans was just too much, and the lead shields necessary had proved too heavy for the rocket's booster to lift above the La Roche Limit. A manned rocket wasn't going to make it beyond earth's gravity--so no test was ever made to send it to the Moon as originally planned. The earth's gravitational pull, it was just too much to overcome with such a dead weight as the rocket after it was fitted with all those six-inch-thick internal shields. If only robotics could have filled in the gap for humans, but that field too was still in a rudimentary stage of development. As for the changes in time due described by the Theory of Relativity, well, that was a minor concern back then with the Russian space rocket scientists! Let the rocket crew return to earth someday and find it utterly changed beyond what they had known, and their wives, families, friends, passed away in the previous generation--what did that matter? The important thing was getting there first before the Americans! But here was a a working prototype of the Soviet nuclear rocket, still able to fly, from the looks of it! Both it and the early prototype of the SL-series booster looked in mint condition, kept mothballed for decades in some thermostat-controlled underground silo in a top secret spaceport 600 miles north of Moscow, then recently, its top secret classification reviewed and downgraded to public domain, hauled down on a special train to Tula's Space Museum to be put on prominent display. 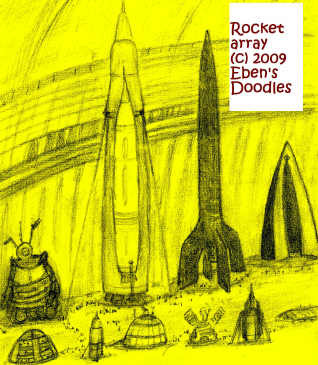 What would he find inside, if he could make it from the booster to the rocket itself? How had they planned to keep the first cosmonauts alive in a nuclear rocket for weeks on end as they explored the Moon, then the rest of the Solar System and then Alpha Centauri before returning to earth? The ladder to the open hatch of the piggyback rocket was still there in place, but the guide hadn't allowed any of them to climb it, since it was too tall and shaky a conveyance for the more "mature" ladies, and they had passed the exhibit by after a long, monotonous listing of the sizes and weights of the booster and rocket. But now was his chance to see something really interesting! He started climbing the extension aluminum ladder and soon was up to the door, high above the floor. Now this action by the bored Larry seeking a little harmless diversion while the others squirmed under the KGB's cold inspection was not well thought out. Russians were notorious for not only disregarding common rules of safety but this particular exhibit was still highly hazardous. It had all been hastily put together--and whatevr safeguards there had been at the cosmodrome storage unit, there was little evidence of them here. And despite the tags that declared empty rods, not all the nuclear fuel had been removed, for somehow in the haste to get it to the Space Museum the double and triple inspectors' checking was curtailed somewhat, and the booster and rocket arrived with enough fuel to send the rocket a considerable distance--perhaps even into space if the booster worked well enough. The booster's solid fuel tanks also were not required to be emptied, for it was thought too expensive and difficult to remove the fuel, at this late date, risking some nasty spills and loss of time in doing cleanup, so the entire array was marked "Cleared for Declassification and Removal to Public Cultural Domain," and that was that! Much of the original supplies for the cosmonauts were also left onboard, as nobody wanted such old army rations and bottled water and juice, and the space suits were outmoded now, to be sure. Many items had also been left to make it seem as if it were just as the cosmonauts had left it--magazines, books, films, chess sets, and other amusements they would need on the interstellar voyage to keep their morale up. 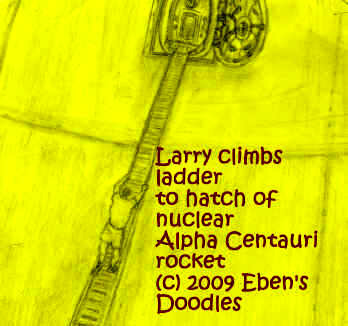 Larry noticed this almost immediately as he entered, he was amazed at the amount of equipment onboard. Taking a flash light, he started exploring immediately, and found the elevator that would take him up to a small entry hatch that opened just beyond the entrance to the rocket. Being a mechanically-minded man, he did not have any problem with the primitive elevator, seeing how to work it, and though it was a close fit--something like a dumb waiter in size, only open and cagelike--he squeezed in, then operated the manual lift system with his hands. Up he went! He didn't know, but behind him the automatic locking system had an early version of the electronic eye and had worked, so that it had closed and sealed the entrance hatch. He knew he had to hurry if he wasn't going to miss his group's release and the bus to the restaurant, if there was going to be a meal for them there, that is. The elevator halted at the level of the living quarters, which lay below the retractible cockpit. He crawled out of the elevator and shone his flash light. With his rather considerable knowledge of mechanics and the operation of railroad engine and track switches, Larry had worked well below his level of expertise--and been content, as the pay was pretty good, the medical, dental, disability, life insurance benefits were rock-solid, and he didn't have to answer directly to the big bosses of the line. Not exactly a people person, he preferred the kind of routine, drudge work he had always had, where nothing changed year after year, and he was left to do his work, and nobody bothered him. But here was his chance to do the things he had always dreamed about--but never cared enough about to actually step out and do. Here there was no boss staring over his shoulder. He was like a kid with his hand in a cookie jar while his mom was out somewhere in town with a lady friend shopping! Working various switches, watching the gauges to see what responses he could get, he didn't imagine, however, that the engines would actually fire. After all, he thought not even the Russians would be so stupid as to leave that much fuel and juice in the operating and propulsion systems. He was quite wrong. Soon the unexpected happened. The engines began firing on the booster. Then the computers, such as they were in that 1960s rocket, began to take over, and he watched helplessly, wondering how to stop the progression of events the dials and gauges were registering taking place right before his horrified eyes. Realizing he needed to flee for his life, Larry sprang up from his cockpit chair, but wasn't quite fast enough. 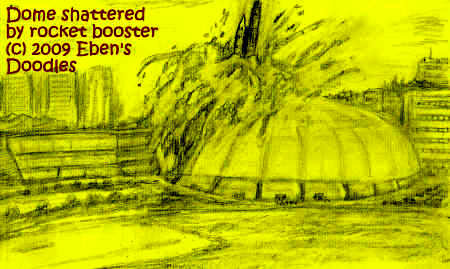 The booster rose, and he was slammed back down in his chair by immense forces. Meanwhile, in the vast building something going on with the stellar rocket was beginning to be noticed. 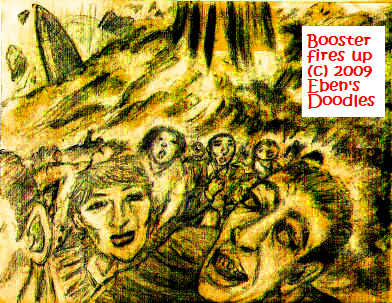 As huge clouds of fire and smoke spewed out into the building and the rocket and booster strained upwards against the restraining cables anchored in concrete, people started screaming and hurrying away as fast as they could. 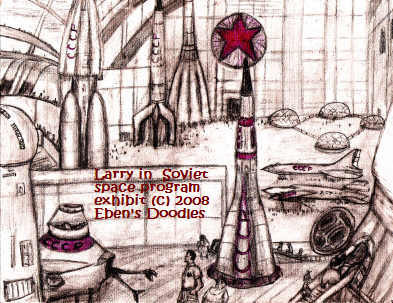 With Larry pinned inside in his chair by a G or two of gravity, the rocket and its booster rose up, snapping the cables whipping upwards and slicing through the canopy dome at the same time the rocket reached it, bursting through relatively unscathed, though the dome was demolished. This rocket was not going anywhere scheduled by the on-board computers, however, as the guidance system was one item that had been removed, as it contained some information the Soviets did not want anyone to know just yet. So the result was that the rocket and booster were headless, so to speak. 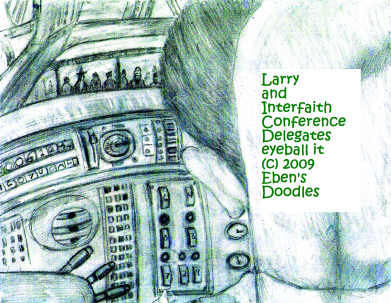 And Larry was the guidance system now, if he could reach the controls, that is. The rocket and booster turned over a number of times, and Larry was upside down, then right side up, and couldn't concentrate on the dials long enough to read them to know what he was dealing with. The lights in the cabin also flicked on and off, which was not the rocket's fault--it was just that more power was being generated than the system could handle at times, and the overloads was forcing the surge protectors to shut down parts of the system. 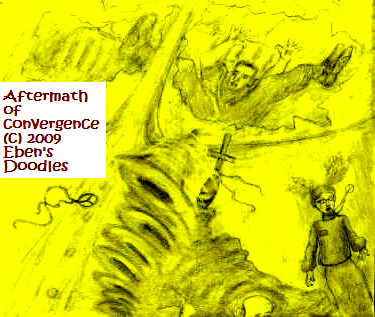 Gradually, however, the primitive computers aboard gained more control, and the system leveled off and Larry found himself in a more or less normal flying mode to see how he might take command. How long it would last, he did not know. He had to work fast, he realized. He flicked on switches, then rapidly flicked them back where they had been set, just to see what might happen. But this could be disastrous, so he didn't experiment very much. It was the guidance control system he was after--the one that was on auto-pilot. He had to take manual conrol somehow! His life, he knew, depended on it. If he could just get the booster to get him to a body of water big enough to take a splash down, he might have a chance to bail out and swim to land. He knew he was heading west, from the ship compass, and would soon be over Germany or even France, depending on whether he came from the north or swung round Germany and crossed the Alps into France. He hoped he might make it to the English Channel. That was big enough to ditch the booster and rocket in, flying it low enough to drop it in, hopefully at a slow enough speed to avoid a disastrous flipping over. He could see the glint of water far ahead, and knew it was the North Sea. 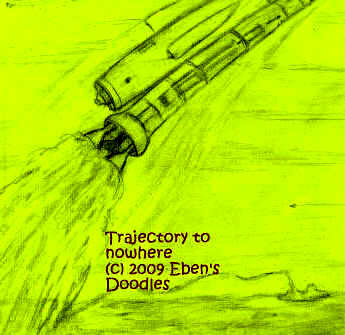 But then the booster surged out of control, and all he could do was hang on, as it swung him and the rocket southerly. Gripping the manual control, punching some switches randomly, he found the manual control responding for the first time, and he kept the booster from turning directly south, which would have put him over Africa. A crash landing in the Sahara sands somewhere, hundreds of miles from anywhere--terrible! Nobody would survive that. As the booster began to lose power, he gained some confidence. He could make a glider out of it, and they were still at such a high alitude, he could just drop gradually down toward the Channel. But Larry was not in control, as he thought. The booster separated just as he was nearing the suburbs of Paris and the legendary Seine was winding below him through the big green, chateau-studded Loire valley. The rocket was thrown free, and the engines ignited. He was on his own, and the manual system in his hand came alive, with all sorts of 1960s beeps and flashing lights on the operator's display--there was no need to force it to do anything! He was in command of earth's first operating nuclear rocket! Unfortunately, this all happened so quickly, the next thing he knew was that he had rapidly descended and a very large object was looming straight ahead! The structure ahead looked disturbingly like the Eiffel tower to Larry's eyes, and he grew very concerned for his own safety. A framework built entirely of massive iron girders, the Eiffel tower was in no danger of ever falling even in an devastating earthquake, and only a well-planned demolition explosion of some kind could compromise the major supports and perhaps topple it. The tower quickly engulfed his vision. It was seemingly so close he could reach out and touch it! He could even see the faces of tourists, delegates from the Global Interfaith Conference (GIC)--Buddhist priests, Sufi imans, Taoist teachers, Hindu swamis, Wiccans, Druid priests, with some Aromatherapists thrown in for good measure. They were holding their annual world peace congress in Paris. Their attention turned to him naturally as he zoomed in like an enormous arrow, the most startling sight every viewed from the sky-scraping iron colossus. For a moment his eyes and their eyes met, and like an accident where all time stops and everything seems to hang agonizingly suspended, it was a moment of convergence he would never forget--if he ever lived through it, that is. Surprisingly, the tower did not stop the rocket. At the upper stages, the tower's girders were too few to stop him cold, not with thousands of pounds of lead shields to hold his craft intact. But if he did not find the tower a piece of cheese, neither was it a brick wall. His rocket sustained some considerable damage, but flew on after convergence, unstoppable but carpeted temporarily with a number of items and memorabilia from the World Peace Congress. As for the tower, it was missing a considerable portion of its upper storeys, and twisted and leaning to one side. Clearly, it would have to be scrapped, whereas the nuclear rocket had just gotten its second wind and was accelerating to full throttle for deep space penetration. 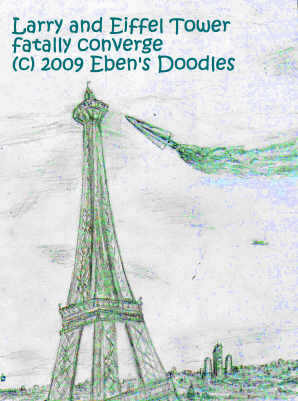 The rocket continued on, leaving Paris (and the bureaucrats of NATO, trying hard to get Moscow on the red telephone hot line for an explanation) in a state of shock with its signature landmark of the 1886 Paris Exposition in shambles, and Larry soon found himself staring at the cliffs of Dover and England approaching rapidly. Perhaps he shouldn't have been trying to take control at that point, for he just locked the automatic pilot instead. The next thing he found was that he was locked out, and a beeping light showed on the panel, and the rocket veered north. He was terrified, now that he had lost all control. What if he landed somewhere out in the howling wastes of the Arctic? He had to try to get control back. Pounding on the control panel, since he didn't know what to do with it anymore, he finally got a response, and the beeping light stopped, making him hope he had resumed manual control. By this time, he was indeed careening across Arctic ice floes and bergs, and the cabin seemed to grow very cold, though it was probably more his imagination. Night was coming on. Later, by the time he learned how to use the manual control, the rocket had returned back to the route it had taken when he first turned on automatic pilot. He hadn't programmed it to do that, but clearly those was the instuctions the rocket had been given by the Soviets, and they were iron-clad. After much effort, all he achieved was bumping the rocket's course up a few degrees. He was speeding up the Thames, which he didn't recognize until the landmarks of London began coming into view. Lit up at night, they were unmistakable--the Houses of Parliament, the Tower of London, Buckingham Palace, Winchester Cathedral, St. Paul's, Tralfalgar Square, Piccadilly's, etc. He knew it had to be London! No other city looked like that. But what was that huge neon-glowing figure of a man doing in the middle of the Thames up ahead? Spotlights were fanning it where it was moving on a barge, and even at his height of several hundred feet he could see thousands of people on the Thames embankments watching it. The colossus looked vaguely familiar. What was it? Then he thought: the King of Pop doing another mega-million dollar promotional stunt to hopefully revive flagging sales of his latest album? That huge, vulgar facsimile of him set on a barge with tugboats and other craft carrying spotlights and sound equipment for the travelling sound and light show, was hardly able to be squeezed up the broad Thames, and many large commercial boats and ships had to be moved or pulled into drydock to let it pass. 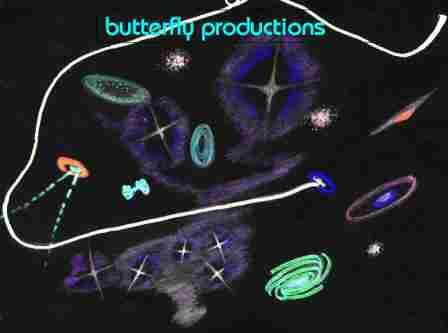 Ever so often, the light show began, with the lights, colors, and patterns racing across the figure as the music boomed. It was the psychedelic dream of the late blasted into space Timothy O'Leary--and had cost millions. Would it succeed and bring in yet another world-wide craze for the King of Pop's latest necrophiliac release--"Corpses in Love"? PLEASE GO TO THE CONCLUDING PORTION ON THE RETROSTAR HOME PAGE.